Its been another gloomy rainy day in the bag at Salcombe but it hasn’t stopped the enjoyment and exploration. There was another visit by the water bowser and another opportunity to top up water tanks before moving to Dartmouth. 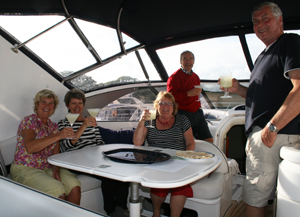 An engineer came aboard the Jeanneau Prestige 42 By Purpose early morning, and it was then towed up to Kingsbridge for repairs at a local boatyard. Lunch was organised at the Ferry pub by members of the fleet. Neale briefed crews over the VHF at 6pm. The weather is looking better tomorrow and the team are looking at a move to Dartmouth. Time Flies will go out and look at the conditions at 8.30, in view of departures from 10am. By late evening the rain had seized but it had turned cold.